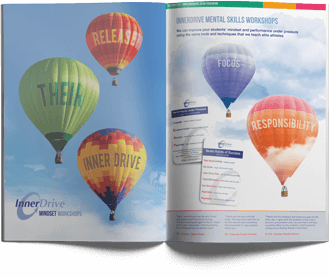 InnerDrive is a mindset coaching company working in education, business and sport. We specialise in realising the potential behind Growth Mindset, Metacognition and stress management strategies and as a result improve motivation, learning, confidence and performance in our clients. Our work draws from traditional areas of performance and sport psychology. Our driving philosophy is to make a difference to our clients lives through releasing their inner drive. We do this through interactive workshops, one to one coaching, blogs and a huge range of practical resources. We still actively work with a number of elite sport clients, including Premiership footballers, international footballers and with GB athletes. However we are now also heavily involved in education in over 300 schools in England. We have also developed courses for companies and for the civil service in the application of growth mindset to business. The company is lead by Edward Watson, a retired Army major, management consultant and entrepreneur and by Bradley Busch, a HCPC registered psychologist. Our coaches always get fantastic feedback from students, teachers, parents, businesses and in sport. We really do make a difference. If you would like to discuss how we could help you, please do get in touch.